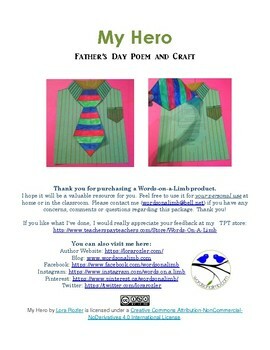 My Hero is a poem I wrote in recognition of Father's Day. I also created a Dress-shirt and Tie craft kit to go along with it. 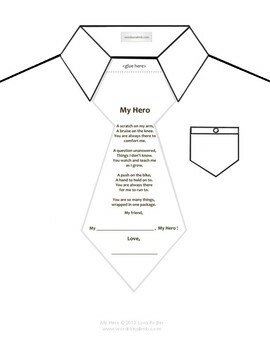 This package includes: the poem My Hero, Dress-shirt template, 3 tie templates (one with stripes that students can colour in a pattern, one with polka dots, and another for students to draw their own design). The shirt template is best photocopied on light construction paper, and the tie on white paper. 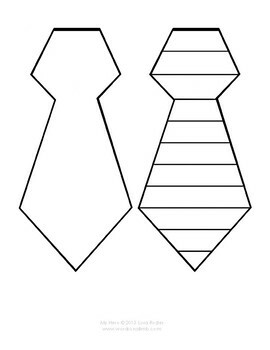 Once the tie is cut out, have students glue the top of the tie onto the neckline of the shirt. When the tie is lifted, it will reveal the poem, My Hero, beneath. The top of the dress-shirt should be cut off (to create shoulders), and the rest of the shirt can be decorated in any way the students choose (polka-dots, stripes, finger-paint splotches, etc.). You will also notice that the word Father was omitted from the poem. This is to allow students a chance to personally address the craft to someone in their life, who may or may not, be their father.